A new thriller from Robert Goddard is always a welcome sight. Quality is guaranteed as the narrative simultaneously drives forward and unveils the past. While measuring the house, Don finds a safe room, cunningly hidden and impossible to enter. He and Blake speculate about its purpose. The house is owned by Mona Jackson, presently divorcing the shady pharmaceutical mogul, Jack Harkness. Don’s former wife, Fran, is the lawyer handling the divorce. Harkness is the subject of a police investigation and has a talent for creating enemies. Some of them turn up at the house and what at first seemed like a nice little earner for Don quickly becomes a nightmare. The mystery of the safe room dominates but Blake constitutes an equally mysterious element. As the story unfolds, she steps in from time to time to give her own perspective, her interior monologues adding depth and resonance. The relationship between her and the hapless Don is at the core of the novel. To some degree, they need each other but it’s Blake who remains the primary interest for the reader. When the secret of the safe room is finally revealed, they are helpless to intervene. How can they possibly escape? 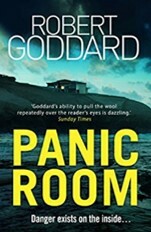 Clever plotting, meticulous detail, all too credible characters and a wry sense of humour make this another classic Goddard novel. Nice work, Robert. Keep them coming, please.